providing whatever the customer needs, even when the customer doesn't know exactly what that is! United Service Alliance develops products from inception through service literature using state-of-the-art 3D parametric software; creating 2D documentation packages, burn, and machine programs directly from the models, insuring quality and fit throughout. BOM's are generated and driven by the models, then linked to our manufacturing software, for discrete control over inventory. Modular aluminum sections, sized to fit in sea container. Normal assembly consists of five sections, but can be configured in any number of combinations. For use in chemical plants and treatment facilities. Variety of sizes and configurations produced. Several sizes and configurations available, ranging from 200m to 3000m. As shown, 3-hp, 3-phase, bi-directional, variable speed drive motor. 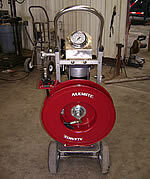 Glycol high pressure cart for refineries. Used for purging debris in analyzer pipe. Allows safe handling of gun strings from on-deck to in water. Provides controlled air-gun deployment depth and offset. Self-contained generator for charging and systems power. Fold-up stairway for entry/egress to HVAC-equipped office space. Many 'first-time' installations around the world in desolate or impoverished areas.